High Peaks Pure Earth has translated a blogpost by Woeser that was originally written for broadcast on Radio Free Asia on January 5, 2011 and posted on her blog on January 10, 2011. As reported on the Dalai Lama’s official website, the Dalai Lama participated in a video conference with Chinese human rights lawyers Jiang Tianyong and Teng Biao on January 4, 2011. 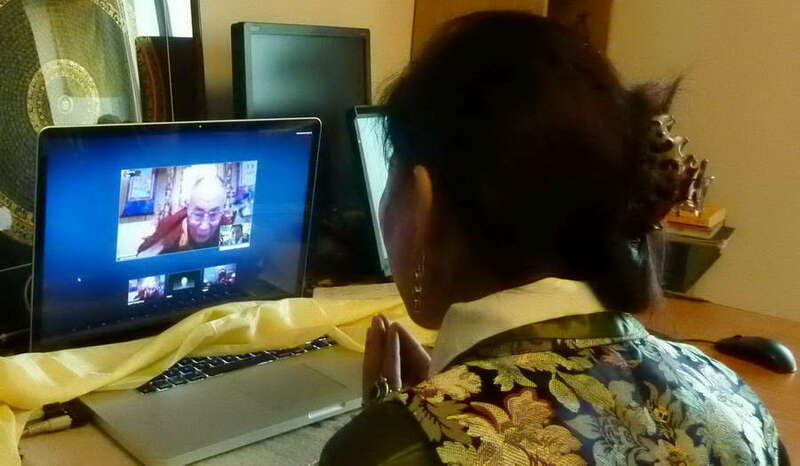 Organised by Woeser’s husband Wang Lixiong, this video conference followed on from a series of Twitter conversations between the Dalai Lama and Chinese netizens that Wang Lixiong organised in 2010. It all started with a video conversation in cyberspace. On January 4, 2011, His Holiness was in Dharamsala engaging in a video conversation with the two human rights lawyers, Teng Biao and Jiang Tianyong, as well as the author Wang Lixiong. And I, I was standing behind Wang Lixiong, attentively listening to every word. When the Dalai Lama appeared on screen, I could hardly believe it, tears started streaming down my face. Seven years ago, in my essay collection “Notes on Tibet”, I wrote this about a group photo showing a father with his son quietly making their way from Lhasa to Dharamsala: “he who conveys an air of humility and modesty on both sides but embraces the centre, is the most illustrious of all devout Tibetan people, the most affectionate, eager person – the Dalai Lama.” Because of this sentence and because of a few articles that touch on the truth, the local authorities labelled my work as “containing severe political errors”, “praising the 14th Dalai Lama and 17th Karmapa, and promoting serious political and religious opinions are wrong. Some essays already to some extent contain political errors.” After this, I was removed from my public position, this is when I left Lhasa. Even earlier than that, already 16 years ago, I composed a poem implicitly conveying: “On the road, I clutch a flower not of this world, Hurrying before it dies, searching in all directions, That I may present it to an old man in a deep red robe. A wish-fulfilling jewel, A wisp of a smile: These bind the generations tight.” Later on, I turned this poem into lyrics, openly saying that “old man in a deep red robe”, is our Yeshe Norbu, our Kundun, our Gongsachog, our Gyalwa Rinpoche – all of which are Tibetan terms of respect for the Dalai Lama. Just like so many Tibetans, hoping to be able to see His Holiness, to respectfully listen to his teachings, to be granted an audience, this has also been my innermost wish; from a very young age, I have always longed for this moment to come true. But, I cannot get a passport, just like many other Tibetans, it is almost unthinkable that this regime that controls us will ever grant us a passport, which should, in actual fact, be a fundamental right that every citizen enjoys. Last year, Lhasa gave out passports to anyone above 60 years of age, albeit only for the period of one week. As a result the office in charge of passports was full of the grey-haired, limping elderly; and it was clear that they were all heading for the foothills of the Himalayas to visit relatives, pay homage to the holy land of Buddhism, as well as to fulfil that dream that no one speaks of but everyone knows. I am sorrowfully thinking that I may have to wait until I am 60 years old until I get hold of a passport. However, the internet gave my passport-less self a pass to travel; in the New Year, it helped me to make my dream come true – through the internet I met, as if in a dream but still very vivid and real, His Holiness the Dalai Lama! I cried and I cried. When I, as Tibetans do, prostrated three times, silently reciting some prayers, holding a khata in my hands and kneeling in front of the computer with tear-dimmed eyes, I saw His Holiness reaching out both of his hands as if he was going to take the Khata, as if he was going to give me his blessings. I am unable to describe with words how I felt: I am really such a fortunate person; in Tibet, many people get into trouble simply for owning a photo of the Dalai Lama. In fact, today, many people from all over China have met with His Holiness and they have not at all lost their freedom, since we are all citizens of this country, Tibetans should also not be punished for having an audience with His Holiness. By then, I had already calmed down and kept the words spoken by His Holiness in my heart. So moving, so touching ! The day will come Woeser la ! The day will come ! Dear Woeser la,you were absolutely right.Seeing the Dalai Lama any where in the world,love,compassion and well-being of the whole world is all he thinks and talks about. You have felt,what exactly is experienced by the millions and millions around the world have with His Holiness the Dalai Lama.His amazingly positive energy and chemistry passes straight through every one's heart and soul. He is the leader of an extra ordinary quality…hard to describe in words.The world looks up to his leadership, (without the nation), with greater respect than President Hu Jintao of China. The Dalai Lama is our pride.He is Tibet's attitude.His teachings is our guidance to future well being of Tibet. We love you and pray for your well and safe being along with your dear husband.Take good care of yourself and the others. It was so moving that tears trickled down my eyes uncontrollably…I'd like to share your experience with all my students here in Exile! The three jewels will always bless you and make your dream come true! You are a model for many woman like us in exile. You are an inspiration to serve the community wholeheartedly. we live in busy life be it in USA or europe or india. but bottom from our heart, we are all Tibetan. we long for our reunification with our fellow Tibetan brother and sisters. time will come no matter what when we will see each other and run our own country with dignity. Dear Woeser la, I need to say to you many many congratulations from my heart ………. Dear woeser la. big TASHI DELEK! very lovely…. The young people of the world are using technology in the service of those human values which transcend national identity, culture, religion, and politics. His Holiness is the living example of those timeless, transcendent values, along with all of you Tibetan activists. Thank you for sharing your experience with us. It reminds me to try to have courage and to not give in to the cynicism of the materialist view. Stories like this bring tears to my eyes. I realise just how lucky we are in the West to have so much access to His Holiness. I myself have been blessed and met him on his Australian visit in 2009. It was an amazing occasion. Thank you from the bottom of my heart for your reportage and your courage. Blessings to you and yours and all good people. Woeser la, I could not stop my tears after reading your moving article. You have expressed the feeling of 6 million Tibetan. Keep writing the truth. May we all meet soon. Dear Woeser la, thank you for sharing such a moving meeting with His Holiness the Dalai Lama. I pray that you will not have to wait till old age to see Him in real life. You inspire millions on all sides of the himalayas with your words, spirit, courage and resilience! Thank you! You are my S/hero! Woser la, I read this with tears in my eyes. I have taught your poems in my classes and my students know and read your website. This summer His Holiness will give the Kalachakra in Washington D.C. 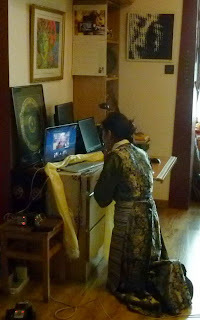 It breaks my heart to know that it is so easy for me to go when you and Tibetans in their own homeland cannot go. I dedicate my Kalachakra to you and to all Tibetans who must live without being able to go freely to see him. Such a moving and tear generating piece. We Tibetans in exile take it for granted the opportunity of being close and listening to his holiness's teachings, talks and initiations etc. Thank you Woeser la for all your immense contribution to Tibetan cause. May Gyalwa Rinpoche bless you. Fantastic!! Good luck from India! it's immensely touching! u exemplified it. 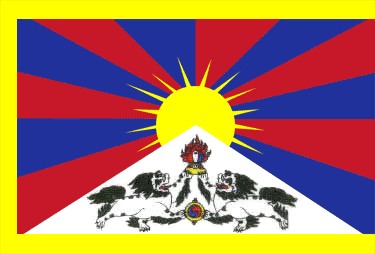 tibet as a nation is in its greatest depression. all tibetans, wherever they may be on earth must be emotionally united and physically effective in their endevour. may Tibet be free one day as we are now in Ireland. OMG i cant stop my tears……I just hope and pray for all the Tibetans in Tibet to have soon meeting with His Holiness..Truth always Triumph!!! There are no words to describe my experience in seeing H.H. Dalai Lama in a group of 6000 others. Compassion,Tolerance,love. You can feel his love like a wave on the ocean from the moment you see him. My heart breaks for the Tibetan people who have been tortured on many levels and have had their basic human rights and liberties denied. You are a shining example of what is good and right in this world. Hope, dedication,undaunted perseverance of culture and faith and I am honored to be able to write this to you all. My tears felt down unstoppingly while going through your article.We are always with you.May this suffering end soon.His Holiness blessing to all beings. Bravo.Only few like you can do in this crowded world. Congratulation!!! its really touching and i really appreciate for all the efforts that you made on Tibet. Never give up!!!! I was home alone and reading this article of yours, although after six months of its post. My heart feel heavy and I cried unceasingly to think again about the plight you and my brothers and sisters are undergoing in Tibet. Thinking that I live in exile and have every opportunity to receive our Yeshi Norbu's teaching and get our Yeshi Norbu's soul-soothing glimpse, makes me feel infinetly fortunate and at same time sad that those of you under Chinese control can't even possess our Yeshi Norbu's picture..I can feel the enormity of your love and reverence for our Yeshi Norbu.. I fold my hand infront of Yeshi Norbu's portrait in my altar, and make wish that our Yeshi Norbu may soon return to our homeland and the innermost wish of you and my brothers n sisters to seek our Yeshi Norbu's glimpse and blessings may come true soon.. I cried incessantly as I wrote this..Tashi Delek to u.
woeser la ,feel so sad and touched after goin through ur post, but dont worry the day will come definately, when we unite. (shije nyamzom) rest take care of urself we need you in future. 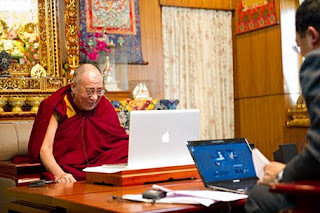 As His holiness and our other tibetans believe, i also believe that 'TIBET WILL BE FREE.'. So, have faith and work hard. Lots of love and thanks to you. 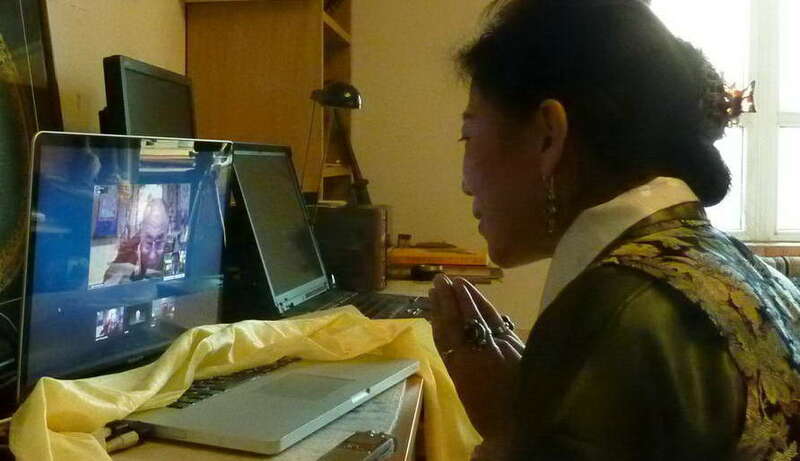 Dear Woeser la, I want to thank you on behalf of six million Tibetans, in and outside Tibet. You are doing a great job, though very risky which is the real sacrifice. I also thank your husband for his moral support in carrying out your movements. Tears were rolling over my cheeks when I read your article especially, with the photo one you kneeling down before the photo of our beloved spiritual leader H.H. the Dalai Lama and Khata before HIM. I came to know about you a year back from TIBET TIMES and the award you were offered for the best poet and writer. I can hear your voice in RFA while Dolkar la translate in Tibetan. Last year I read your book SARJEY, that was superb. From my side, I'll be serving our exile community with full dedication, loyalty and sincerity. We'll be thinking of you, Woeser la. the nation with power of business and military conquer the world with no surprise. a simple buddhist monk with no power of business n military conquer the world is matter of surprise. You are truly such an inspiring person for all of us here in and outside Tibet. I have regularly read your blogs and also what others write about you. Many times I have cried as I feel your pain and frustration living under such an oppressive regime. You are indeed the daughter of Tibet inspiring us all and shining the true light on the conditions of Tibet. I often worry about your safety and have wondered what could be done. I hope to meet you one day. Please take care. You are our lost sister. We love you truly as our sister. This is very touching story .I have been reading about the Holy Land Tibet for long time . I am very happy with my government in India who is giving refuge to all the Tibetans in need. Tibetans are always welcome to my country India. We support Free Tibet. I guess i am the last one to read this piece even though i follow your writing through this site and merabsarpa. WOWWWWWWW!!!!! It is really very touching and i believe just like the Tibetan in TIbet are waiting for a time see His Holiness in Tibet or in Person there are thousand like my aged father whose dream to visit Lhasa is just just as strong and unfulfilling. I hope a day will soon come when when all the deam from the people at two side of Himalaya will come true and like all six milion Tibetan i believe it willllllll!!!!! till then Please keep working for Tibet and Tibetan.